From Dallas: Take Interstate 20 East (I-20E) approximately 100 miles and take exit 562 (FM 14). Go north on FM 14 through Hawkins. Five (5) Miles North of Hawkins, turn right at the four-way stop onto FM 2869. Go 1.5 miles east on FM 2869 and you’ll see the Brookhaven sign on the left. Turn left onto CR 3909 (blacktop road) and proceed ¾ mile to the Retreat Center. When the road splits, keep straight to enter the Retreat’s parking lot. 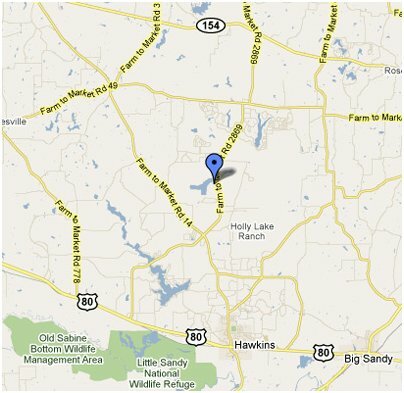 From Tyler: Take FM 14 north from Tyler’s Loop 323 until you reach Hawkins (Approx. 17 miles). Five (5) Miles North of Hawkins, turn right at the four-way stop onto FM 2869. Go 1.5 miles east on FM 2869 and you’ll see the Brookhaven sign on the left. Turn left onto CR 3909 (blacktop road) and proceed ¾ mile to the Retreat Center. When the road splits, keep straight to enter the Retreat’s parking lot. From Texarkana: Take Interstate 30 West approximately 75 miles to the State Highway 37 exit at Mt. Vernon, TX. Go South on Hwy 37 through the town of Winnsboro. Approximately 7 miles South of Winnsboro, turn left to go South onto FM 14. Approximately 20 miles South of Hwy 37, turn left onto FM 2869. Go 1.5 miles east on FM 2869 and you’ll see the Brookhaven sign on the left. Turn left onto CR 3909 (blacktop road) and proceed ¾ mile to the Retreat Center. When the road splits, keep straight to enter the Retreat’s parking lot. From Paris, TX: Take Hwy 27 from the Southeast part of the Loop around Paris. Go Southeast approximately 22 miles to the little town of Bogata. Turn right onto Hwy 37 through Winnsboro. Approximately 7 miles South of Winnsboro, turn left to go South onto FM 14. Approximately 20 miles South of Hwy 37, turn left onto FM 2869. Go 1.5 miles east on FM 2869 and you’ll see the Brookhaven sign on the left. Turn left onto CR 3909 (blacktop road) and proceed ¾ mile to the Retreat Center. When the road splits, keep straight to enter the Retreat’s parking lot. From anywhere else: Go to one off the above mentioned cities and proceed according to the appropriate directions. God’s speed. Our Guiding Verses: Jeremiah 29:11-13 - For I know the thoughts that I think toward you, saith the LORD, thoughts of peace, and not of evil, to give you an expected end. Then shall ye call upon me, and ye shall go and pray unto me, and I will hearken unto you. And ye shall seek me, and find me, when ye shall search for me with all your heart.